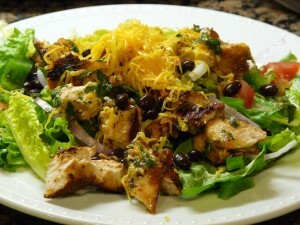 In the past I posted a Southwestern Chicken salad recipe and another recipe for Taco Salad. They are simple recipes with very few ingredients. This recipe for Black Bean Chicken Salad is a step up and showcases a zesty dressing that turns the ordinary into extraordinary. Yes it is a bit more work but oh so worth it especially if made with Cilantro Lime Chicken. In a large serving bowl, combine the lettuce, chicken, beans, tomatoes, green pepper, onion and cheese. In a blender or food processor, combine the vinaigrette ingredients; cover and process until smooth. Pour over salad and toss to coat.